This surname is of Anglo-Saxon origin, and is a locational name from a parish and village thus called near Liverpool in Lancashire. Recorded as "Hitune" in the Domesday Book of 1086, and as "Hutona" in Early Lancashire Charters, dated 1189, the component elements of the placename are the Olde English pre 7th Century "hyth", landing-place, with "tun", village, settlement; hence, "settlement by a landing-place". Locational surnames, such as this, were originally given to local landowners, and the lord of the manor, and especially as a means of identification to those who left their place of origin to settle elsewhere. 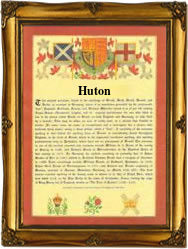 Regional and dialectal differences subsequently gave rise to several variations on the original spelling of the name, which in the modern idiom is found as Hutton, Huton, Utton, Huyhton and Huyton. Occasionally, this surname may be confused with those deriving directly from any of the various places in Lancashire, and elsewhere, called Hutton, but these places are almost invariably recorded as "Hotun" in the Domesday Book of 1086, and have the Olde English "hoh", hill-spur, as their initial element. Recordings from Lancashire Church Registers include the christening of Thomas Huton, an infant, on June 8th 1510, at Ormskirk, and the marriage of Jacobus Huyton and Alicia Boulton on December 12th 1591, at Childwall, Lancashire. The first recorded spelling of the family name is shown to be that of Nicholas de Hutune, which was dated 1246, witness in the "Assize Court Rolls of Lancashire", during the reign of King Henry 111, known as "The Frenchman", 1216 - 1272. Surnames became necessary when governments introduced personal taxation. In England this was known as Poll Tax. Throughout the centuries, surnames in every country have continued to "develop" often leading to astonishing variants of the original spelling.